This can be a cool thread to talk about the Seahawks and other teams that are in contention for wild card spots in the NFC. If the season were to end today, the two wildcard teams in the NFC would be the Vikings and the Redskins. The Vikings have a very tough game at New England coming up this Sunday. The Redskins have a tough game at Philadelphia and they don't have their starting QB, so I am going to assume that they will start to fade away down the stretch. The Seahawks have done a great job beating the other teams contending for a wildcard spot in the NFC including the Panthers, Packers, and possibly the Cowboys. As long as Seattle takes care of business against San Fran x2 and Arizona, the Minnesota game in two weeks will effectively be a playoff game. BTW, hopefully KC has everything wrapped up by week 16, and benches the entire team. 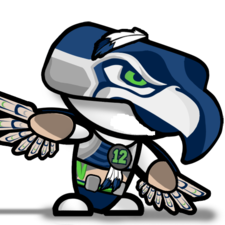 The Seahawks are currently in! The Seahawks picked up extra steam with the Vikings, Redskins and Panthers all losing. Really proud of these guys. Quick look after the Vikings game, but Seattle seems to clinch with a single win in their next 3 games. They hold all tie breaks [Packers, Panthers, Vikings], and Washington and Philly play in week 17. So Seattle is in with one win (I think). Is it still true that Seattle clinches a playoff spot with a win this upcoming week or next week? Also, do you know who has the tie breaker between the Eagles and Seahawks?